Illustration differs from traditional painting in that it was work produced “on assignment,” or at the request and to the specifications of a particular editor. 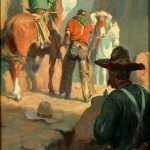 The original illustration, usually a painting or sketch, was reproduced in abundance. 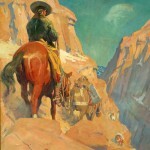 While working to fill specific needs, illustrators nevertheless exhibited enormous originality in their ability to dramatize a scene and capture the imaginations of diverse readers. On Assignment offers illustrations from a variety of genres. Howard Pyle’s painting He lost his hold and fell, taking me with him (1909) comes from “The Grain Ship,” a thriller that appeared in Harper’s Monthly Magazine in March 1909. Bertha Corson Day, a student of Pyle, illustrated children’s stories, and two of her works from Where the Wind Blows are included. 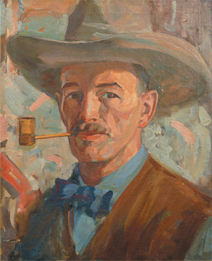 Gayle Porter Hoskins, who continued to live in Wilmington after studying with Pyle, has several works in the exhibition, largely from western stories. 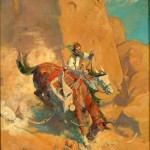 Western illustrations by Allen Tupper True are also featured. Other genres represented in the exhibition include humor, literature, fashion, sports, and silhouettes. The conservation of the paintings by Allen Tupper True in this exhibition was made possible by a generous contribution from the Delaware Art Museum Council. Founded in 1967, the Museum Council is a volunteer organization that raises funds to help support Museum programs. The Delaware Art Museum, located at 2301 Kentmere Parkway, Wilmington, DE 19806, is open Wednesday through Saturday 10:00 a.m. – 4:00 p.m. and Sunday noon – 4:00 p.m. Admission fees are charged as follows: Adults (19 – 59) $12, Seniors (60+) $10, Students (with valid ID) $6, Youth (7 – 18) $6, and Children (6 and under) free. Admission fees are waived every Sunday thanks to support from AstraZeneca. For more information, call 302-571-9590 or 866-232-3714 (toll free), or visit the website at www.delart.org.